Because the Paradigm Health System mindset is constantly focused on collaboration, their multi-specialty physicians were all in enthusiastic accord about the recent addition of nationally recognized podiatric surgeon Daniel H. Hake, DPM, FACFAS. In particular, Darren M. Vigee, DPM — the veteran podiatrist on Paradigm’s extensive team of specialists and committed healthcare professionals — was quick to see the advantage of adding a second podiatric surgeon. From his point of view, Dr. Hake can’t imagine a better fit. Citing the abundant expertise and superior collaboration at Paradigm Health System, Dr. Hake says he is honored for the opportunity to work with top-notch partners, especially Dr. Vigee. He felt confident it was the best place to grow his podiatric presence on the Northshore. Dr. Hake joined Paradigm Health System after gaining almost 30 years of experience in academic and surgical programs at the University of Osteopathic Medicine and Health Sciences in Des Moines, Iowa, and practices at Ochsner Northshore and the Louisiana Heart Hospital. Dr. Hake’s training is the perfect counterpart to Dr. Vigee, who did his internship and surgical residency at Lakeland Medical Center in New Orleans. While both doctors’ clinical interests include sports injuries, plantar fasciitis, trauma and diabetes complications, Dr. Hake’s claim to fame is reconstructive surgery of the rear foot and ankle. He is the only podiatrist in the state of Louisiana who handles the Wright Medical total ankle replacement. Dr. Vigee recently saved the foot of a woman who experienced a traumatic “degloving” (skin removal) and was pleased to have a wound specialist discuss the case at a recent symposium, citing in particular how a multidisciplinary approach to healthcare creates great outcomes. Due to those surgeries and others, Drs. 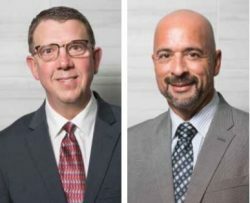 Hake and Vigee say the boutique atmosphere and cutting-edge operating rooms of Paradigm’s Sterling Surgical Hospital are a huge additional advantage to the Paradigm System. Another frequent procedure Dr. Hake performs is the HyProCure procedure, a minimally invasive surgical implant to treat misaligned feet. The condition affects an estimated 45 percent of the population yet often gets misdiagnosed as its symptoms are often knee, hip and back pain. His extensive experience has led to his practice being named by Gramedica as the region’s sole Center of Excellence for the procedure. Last but not least, he is one of only 1,100 podiatrists in the United States to hold a board certification from the American Board of Foot and Ankle Surgery in both foot surgery and reconstructive rear foot/ankle surgery. According to Kevin Schneider, President of Paradigm Health System, Dr. Hake is an ideal addition to the Paradigm team. “Knowing Dr. Hake was in great demand, I feel honored he chose Paradigm Health System,” Schneider says. “His decades of academic work and experience in complex podiatric surgery is the perfect complement to Dr. Vigee’s highly skilled practice. Paradigm Health System was founded to provide physicians a bastion to remain viable in a private practice setting. Schneider says the secret to their rapid success comes through better clinical outcomes; friendlier, more personal care; pristine patient-care environments; and a great work culture with invested personnel. Paradigm Health System provides care throughout the Southeast Louisiana area with offices in Slidell, Lacombe, Mandeville, New Orleans East and Metairie. Sterling Surgical Hospital, located in Slidell, is easily accessible for all patients right off the intersection of Interstates 10, 12 and 59. Specialists include neurology, interventional pain medicine, orthopedic surgery, podiatry, spinal surgery, radiology and more.